There Is Another Sky is the first solo show of Vanessa Lam’s work in New York. The title draws on an Emily Dickinson poem of the same name and suggests “the existence of another mysterious place where the sky, forest and leaves behave differently from the physical universe that we know and see” according to the artist. In Lam’s work, the sky becomes a leitmotif and represents the idea of the pictorial space as a possibility of another realm where the viewers enter her work and see their everyday environment anew. 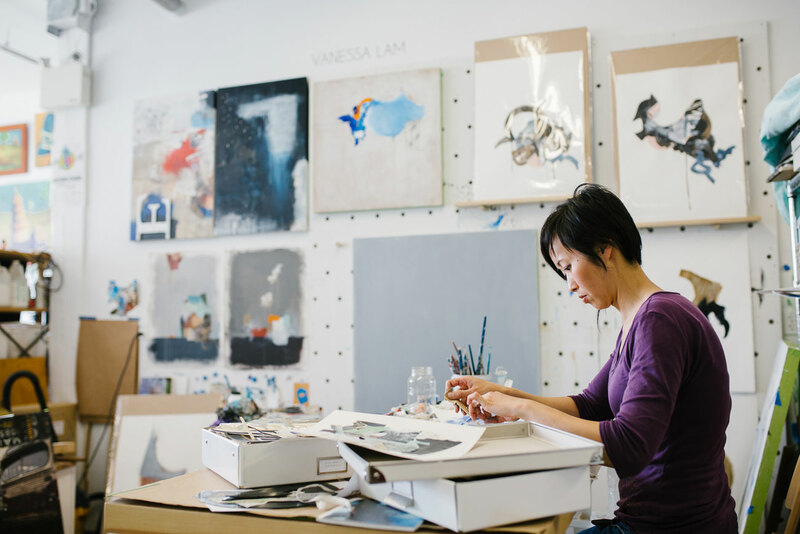 Vanessa Lam lives and works in Vancouver, British Columbia. She interprets the tension between urban and organic environments through mixed media, painting and collage. Her works possess a strong sense of gestural movement and mark-making and are in dialogue with the history of abstraction while balancing contemporary consideration of industry and urban renewal. Lam’s gestures are intentionally contrasting, combining hard-edged geometry with organic forms, splatters and element of chance. Her works evolve out of conscious observations, shaped by the atmosphere around her. In 2017 Vanessa was awarded the Bombay Sapphire Artisan Series Grand Prize in recognition of her paintings. She recently completed a one-month residency at Takt Projektraum in Berlin, Germany. Her work was featured in Create Magazine and Uppercase Magazine. Over the past five years, Vanessa has exhibited her work in artist-run and public galleries across Vancouver and internationally.